The Russian Soyuz MS-02 spacecraft was rolled out Oct. 16, 2016 at the Baikonur Cosmodrome in Kazakhstan in preparation for an Oct. 19 crew launch. A new, space-station-bound crew will lift off early Wednesday morning (Oct. 19), and Europe's Schiaparelli landing capsule will touch down on the surface of Mars later that day — and you can watch both events live online, courtesy of NASA and the European Space Agency. 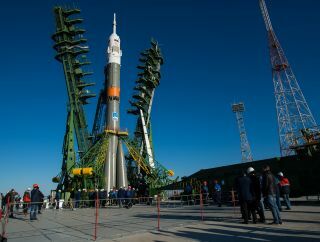 First, at 4:05 a.m. EDT (0805 GMT), NASA astronaut Shane Kimbrough and Russian cosmonauts Sergey Ryzhikov and Andrey Borisenko will launch on a two-day journey to the International Space Station from the Baikonur Cosmodrome in Kazakhstan. Coverage will start at 3:15 a.m. EDT (0715 GMT). The ExoMars orbiter and lander split apart three days ago, after a seven-month trip to the planet. The lander will test out technologies that are intended for use in an ExoMars rover that will launch in 2020 — using heat shields, a 39-foot (12 meters) parachute and its thrusters to slow its descent before dropping to the ground. Over its first few days on the planet, before its battery winds down, the lander will measure Mars' wind speed and direction, humidity, pressure and electric fields, plus the atmosphere's transparency and temperature, and send those measurements up to the orbiter. It is Kimbrough's second spaceflight; he launched on the space shuttle in 2008 to help assemble the space station — the crew added a bathroom, kitchen, two bedrooms, an exercise machine and water-recycling machine to the station, according to a NASA document. Borisenko is on his second trip to the space station, and this mission is Ryzhikov's first flight into space. All three of them will return home in February. The new crew arrival will bring the space station's numbers back up to six; NASA astronaut Kate Rubins, Japanese astronaut Takuya Onishi and Russian cosmonaut Anatoly Ivanishin have been alone on the station since Sept. 6.